Governor Christie highlighted his budget and reform initiatives in addition to answering questions from members of the audience at a Town Hall meeting in the hometown of Bruce Springsteen, the governor’s musical hero. 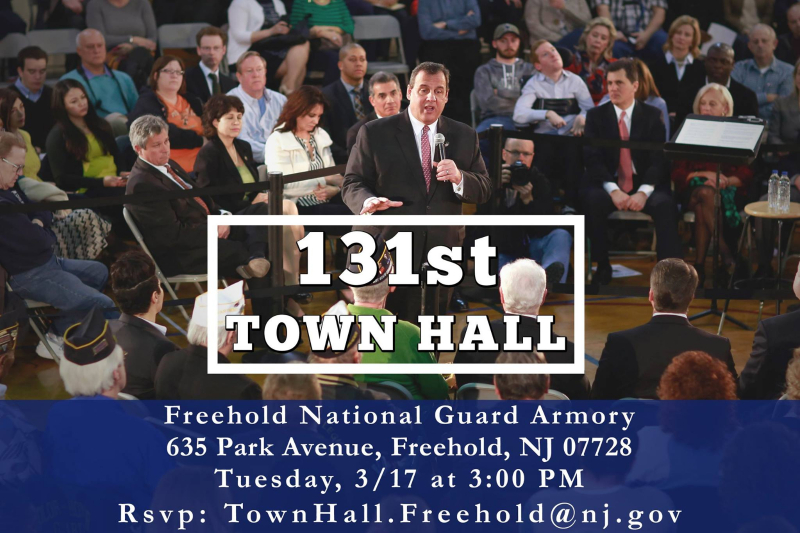 Governor Chris Christie came to Freehold this week, March 17, 2015, to meet citizens for his 131st town hall meeting at the National Guard Armory. As often the case, his comments receive much media attention from the likes of CBS News, Wall Street Journal, Newark Star Ledger, and the Associated Press, to name a few. While their attention was on his key issue of the budget plan, not so from our local Asbury Park Press. They seemed to lead with, although important, a Spelling Bee contest and their leaning against the PARCC testing. As reported, the Governor’s comments focused on his proposed budget plan concentrating on issues such as the need to reduce health care costs, to fund the state’s pension liabilities resulting from past administrations from both parties. Christie contended that his predecessors, including Governors Christine Todd Whitman and James Florio, hadn’t paid their fair share in the pension plan. A highlight of the event was during the question and answer period, in his neatly pressed Troop 33 khaki scout uniform, 12 year old Zachary Seemar of Brick Township, reading from a carefully typed script provided by his mother Kathleen, asked if the governor was “aware of how difficult Brick’s permit review process is for families like ours trying to rebuild,” and “if there is anyone at the state level we can go to for assistance?” Providing a pen for Zachary to write down his address and phone number, Christie promising to have someone from his office get in touch on Wednesday. Indicating the he was “aware of how long the permitting process is taking in a lot of places,” Christie said, “We want to get you back as quickly as possible.” “First off, we’re happy to help. But each town wants to control their own zoning, and make their own decisions,” he said, adding that municipalities “get a bit touchy when the state gets too involved in that” but that the “extraordinary circumstances” of Sandy allowed the state to “have influence” on some of the permitting processes. Mr. Christie’s 131st Town Hall in the hometown of Bruce Springsteen, the governor’s musical hero, is the initial meeting that he will continue to hold weekly in New Jersey, until the fiscal year closes out at the end of June.